My little sis is getting married this weekend! I’m so excited for her! It’s going to be an amazing wedding. She has been working so hard planning this wedding I just know it’s going to be amazing. My little guy is the ring bearer. 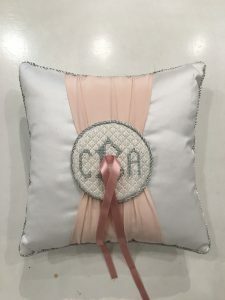 So naturally I offered to make the ring bearer pillow. The ribbon is tacked on and will be snipped off after the wedding so she can use it in her new home. A simple monogram and a quick stitch. If you’re interested in this simple design let me know. We can paint up a custom canvas just for you! I used extra fabric from my bridesmaid dress to add a little color to the pillow. I had about three extra feet of fabric! I know I’m short but who are they making these dresses for? Giants? LOL! I’ll share pictures from the wedding next week. Wait till you see Trip in his top hat. His idea. . .not mine. “Men look great in tuxedos. I need a top hat with mine.” From the mouths of babes! How fun, Suzie! Trip certainly has his own style…I love it! Have a great time at the wedding! !